On October 31, 2013, the 12th session of the Standing Committee of the National People’s Congress in the legislative plan released, E-commerce Law is listed as the second project, being one of the draft laws which are in need of working immediately, when ripe for deliberation. The E-commerce law formally on the agenda of China’s top legislature for the first time, marking China’s E-commerce is about to open a new historical stage of the development! Meanwhile, in 2013, along with the deepening of our country’s E-commerce application influence on traditional business, circulation, finance, services, and people’s work, communication and life, in all areas of the understanding of the electronic commerce is constantly refresh and subversion. Problems related to the E-commerce law and governance is concerned from different angles by all areas. Under the big background, under the support of relevant units, ChinaEClaw.com, Institute for the Internet Policy & Law BNU ,Policy and Law Committee of China Electronic Commerce Association and 315online.com.cn are plan to integrate the resources to form a professional high-level legislative support platform -Ceremony of Research Platform on E-Commerce Legal Support. Through the platform, gathering relevant departments and experts, enterprise, electronic retailing, service providers, lawyers, etc., communicate and discuss regularly for our country’s legislation of E-commerce. 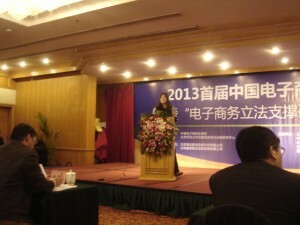 2013 Founding High-Level Forum on Chinese E-commerce Legislation and Ceremony of Research Platform on E-commerce Legal Support was held on December 28, 2013. Prof. Hong Xue, co-organizer, invited Dr. Luca Castellani from UNCITRAL Secretariat to join the conference and give a keynote on International E-Commerce Legal Issues. United Nations Commission on International Trade Law, NPC Financial and Economic Committee, Legislative Affairs Commission, Business and Communication Department of Legislative Affairs Office of the State Council, Supreme Peoples Court, High-tech Department of Development and Reform Commission, E-commerce Department of Ministry of Commerce, Department of Treaty and Law, IT Promotion Department of MIIT, Department of Policies and Laws, Market Department of SAIC, Network security Bureau of MPS, Payment and Clearing Department of Central Bank, Local Government Departments ofBeijing,Shanghai,Hangzhou, Shenzhen,Chongqing,Nanjing, Fuzhou etc. And mainly are the national E-commerce demonstration cities and more than 30 leading E-Commerce Enterprises (Alibaba, Tencent, Jingdong, Suning, Baidu, Amazon, Dangdang etc. ).